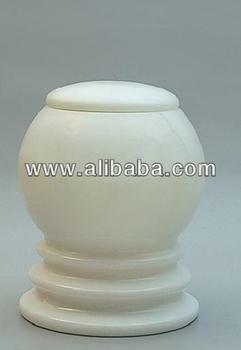 manufacturer and exporter of Ash Urn, cremartion urn, funeral urn,pet urn, keepsake urn. Rounder White Marble Urn 7.5x7.5x10 inch Urn best for cremation ash, beautifully handcrafted white marble natural stone , Having top Loading with lid, for ashes. with elegant design . We support Importer/ Funeral Home by supplying beautiful Urn in Bulk quantites in Bulk price. Price based on Bulk quantity for bulk supply. Serious buyer contact us .